TravelLogic Series - TEAM SOLUTIONS, INC. 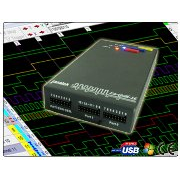 The TravelLogic Series of Logic Analyzers are small enough to fit into your shirt pocket, yet are truly sophisticated logic analyzers, capable of 4 GHz timing analysis, or 200 MHz state analysis, with up to 72 Mb total stackable memory and up to 36 channels. They plug into a PC or Laptop USB port making them ideal for the field service technician or engineer, hopping from PC to PC, or taking with them for diagnosis on the road.